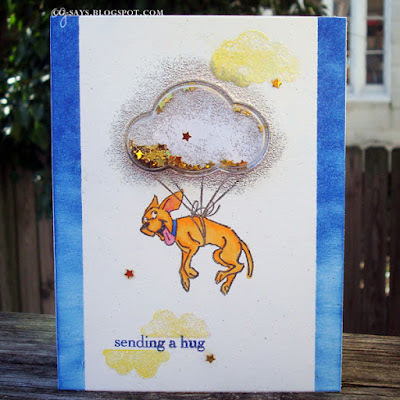 I always get a smile from this dog stamp by Art Impressions' Flying High Clear Set, and pairing it with a Jillibean shaker card just made it cuter! The cloud stamps are from an Artsy Fartsy set. I stamped them in white, then heat-embossed that with a glittery powder, and inked them again, this time with yellow. The sentiment is stamped with the same blue ink as I used for the edges. The inside & outside of the shaker is "lined" with silver embossing powder. The shaker is filled gold star confetti. This sure gives me a smile! Update: Wow, this card was an Honorable Mention for Art Impressions Challenge #178! So cute! That dog does make you smile. I love the cloud being a shaker. Great job! Fabulous idea for a shaker card, so cute! Thanks so much for playing along in my Critters and Creatures Linky Party, a new linky party will be posted on Monday, hope you'll come join in then!